Thirty years ago, the American photographer Christopher H. Warren called the small Tuscany hilltown of Sorano his home. His debut book “All the Noise of It: Living in a Tuscan Hilltown” encapsulates most of his experience as an expat and a member of the local community since then – renovating his house and garden, indulging in his passion for ceramic sculpture, photographing the abandoned parts of the town, learning the secrets of Italian cuisine and even making his own wine. But the most important role of the book is to bring back to life the memories of the last inhabitants of Sorano whose stories Warren has included along with black-and-white portraits. 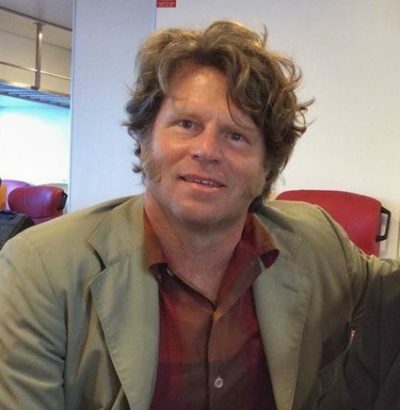 We contacted Christopher H. Warren who shared details about the book and his life in Sorano, specially for 203challenges.com. >>> Read an excerpt from the book HERE. – Who is Christopher H. Warren and what are his dreams? – I have a lot of interests. When I first moved to Sorano, it seemed like the ideal place to pursue my passion for making ceramic sculpture. I had thought that I could spend half the year making sculpture, and the other half continuing my work as a documentary photographer. In reality it took me many years to get to the point where I could devote even a relatively small portion of the year to my artwork – and that was partly because it took me much longer to finish the renovation of my home and garden than I imagined, particularly as those projects – the house and the garden – always got bigger. Ironically, my dedication to Sorano and the home I made here meant that I also undermined my work as a photographer. Thirty years ago, a professional photographer – or anyone really – could not just disappear and spend months working on house renovations, even if it was in Tuscany. When I first got to Sorano there basically were two pay phones – one in a town bar and the other in a restaurant. No cellular phones and certainly no Internet. I was cut off and out of touch. Nevertheless, I did continue to work on and off, and I got to making a studio and doing some of my ceramic sculpture. I also participated in and ran an important international art show that was based in Sorano for 10 years, which introduced me to the business and administrative sides of the art world, which I quickly realized were not for me. One of my other great interests that I have cultivated in Sorano regards Italian cookery, and I have done some simple and fun YouTube videos about the Tuscan table. My next book, “Feasts from Paradiso,” is about my garden and caves and the feasts – traditional, historical and fanciful – that I hold there throughout the year. My current aspiration is that “All the Noise of It” is successful and brings attention to some of my other efforts. – Which of your previous habits have you lost being part of the local Sorano community? – The implication of the question is that habits are bad, I suppose. I can’t think of anything bad that I have stopped doing – except for perhaps eating poorly. I now eat much better! I can say that I have lost illusions. I had a certain illusion about the greatness of America and the power that bestowed upon me. Although the idea of America is good, a lot that has been done in its name in these last years has tarnished its image. Americans are not as admired or loved as they once were – like during the period post-World War II. So, I no longer count on that odd idea of a protective veneer – and maybe even a strange sense of superiority it gave me. 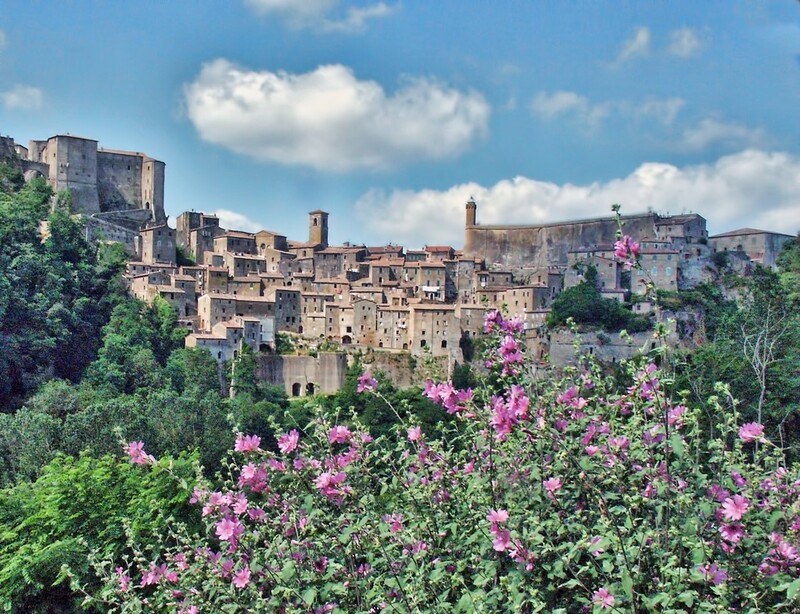 – Share a story you have heard from the old inhabitants of Sorano! – I think you will have to refer to my book for the many stories that the old inhabitants tell in their own words about their past life in Sorano. Basically, up until 1960, life was as it had been for centuries in the old town – and it wasn’t easy. My old friends became tough and resourceful and genuinely interesting characters for their experiences. – What are stereotypes about Tuscany you have found to be wrong? – There is the stereotype that Tuscany is forever summery, flowery and gently amusing, as evidenced in that now-famous book by Frances Mayes, “Under the Tuscan Sun.” I facetiously thought of titling my book “Under a Tuscan Cloud” – a cloud that brings replenishing rain, but also damaging hail and unpredictable vortices. – What are the reasons why Sorano has turned into an almost abandoned town? – Unless you dig deeply enough, Sorano and other rural towns in Italy are unappreciated and thought of as being primitive by their own people. Particularly after World War II, most of the rural population wanted to escape what was then an essentially feudal society of wealthy landowners and the rural peasantry and seek better opportunities in the cities and abroad. – Moving to Tuscany to restore a house and live there has turned into a collective dream of many Americans and Europeans. What would you tell them as someone who has been all through this? – Basically, if you have enough money, you can buy a dream house in a dream location, have it renovated for you, and have wonderful superficial holidays. But, if you wish to invest sweat and tears and renovate a place yourself and become a member of a community, it is a steep and often very frustrating learning curve. Frankly, to those people who come new to Sorano or other small rural communities in Italy from the U.S., the U.K. and many other countries of the world, I always advise them to think of their place as a holiday home, and not as a year-round residence. I managed and became a much stronger person for my experiences – but other people could be overwhelmed. Sorano is beautiful and wonderful, but there are always clouds looming, and one never knows what those clouds might bring. – One cannot help but be inspired by the ingenuity of man to adapt to his surroundings and create safe, functional and beautiful places to live in. Sorano is built upon and surrounded by outcroppings of tufa – volcanic magma. Men determined that the magma could be cut into blocks for building and so Sorano and many of the other hilltowns in the area were built out of the tufa. Local veins of clay were found, and terracotta was used from making roof and floor tiles and drain pipes to pots used for cooking. Everything used was local. 15 kilometres away the land is predominantly clay, so most of the hilltowns around Siena are made of brick. This idea of living locally is inspirational and an essential lesson for the future of mankind. For more information check Christopher H. Warren’s website.